To love and care for all of us on Earth, especially children. Angels are always here for us. All we need to do is ask them for help. Angels want us to be happy and to know we are loved. Michelle Beber is certified as a spiritual teacher, archangel life coach, and angel intuitive, the latter certification from a renowned Hay House author and speaker. 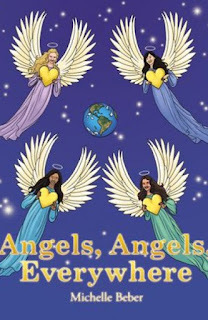 Michelle's mission is to teach, touch, and entertain readers with "stories from the angels." Michelle's life changed when she attended a spiritual retreat in 2008. There, she learned about repetitive number sequences known as "angel numbers." Having always been fascinated by things "beyond this world," she started researching everything she could about "angel numbers," which, of course, led her to discoveries about angels themselves. 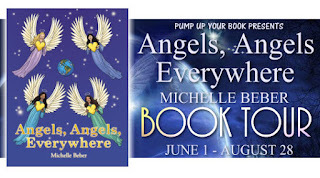 Michelle read almost every "angel book" out there. 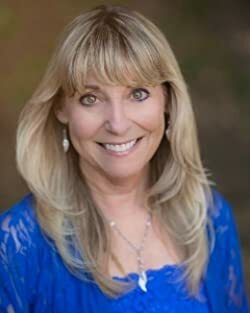 Her voracious appetite for "all things angels" led her on a spiritual path that included attending annual spiritual conferences where she was told she was close to finding her life purpose (which she didn't take seriously at the time), that she was a "lightworker" working with Archangel Michael to "get a message out," and that she would help children (she took the last two very seriously). Ever since she was a child, Michelle always loved to write, and as she went through her life without that creative outlet, she always felt like "something was missing." That "something" turned out to be angels! She feels very blessed and elated to be able to follow her passion and bring comfort and joy to children. This is the first of three "angel books" in a series for children. This first book contains beautiful illustrations by Susan Shorter that brilliantly capture every emotion and truly bring Michelle's visions to life. Michelle has other books and a blog in the works as well. Please visit her author page at www.facebook.com/pages/michellebeberauthor and her book page at www.facebook.com/pages/Angels-Angels-Everywhere-by-Michelle-Beber. She also has a Twitter page at @BeberMichelle. A website is being developed at www.michellebeber.com. With love, light, and angel blessings to all of you! How could I not fall in love with this book? It is marked as "Children's Literature" but I assure you any adult will also find comfort in this book. The author has comforting words and images for every time you feel down or up. It is also the perfect book to read to your child at bedtime or when the family is going through a difficult situation especially when a friend or family member is facing illness. From personal experience, I used this book to explain to my two elder children about a close friend's illness. They were comforted but it also led to questions about her condition and as a mother I appreciated this long talk we had because I was able to respond to thoughts and feelings they had previously not brought up. Would I recommend this read? Absolutely. I recommend it for both adults and children. If you were a fan of the Touched by Angel series, you will love this book. Offensive content? : Based on language and settings, I would recommend this book for all ages. Disclosure: I received a review copy of this book from the author. I did not receive any payment in exchange for this review nor was I obliged to write a positive one. Lieutenant O’Toole’s goal is simple: someday he wants to become an admiral. But in a few moments, his life will change . . . forever. Yesterday, the marines stormed the beaches of Guadalcanal. Today, the Japanese Navy will strike back. The sudden and horrific carnage scars O’Toole for life and throws him into the abyss of survivor’s guilt and posttraumatic stress. 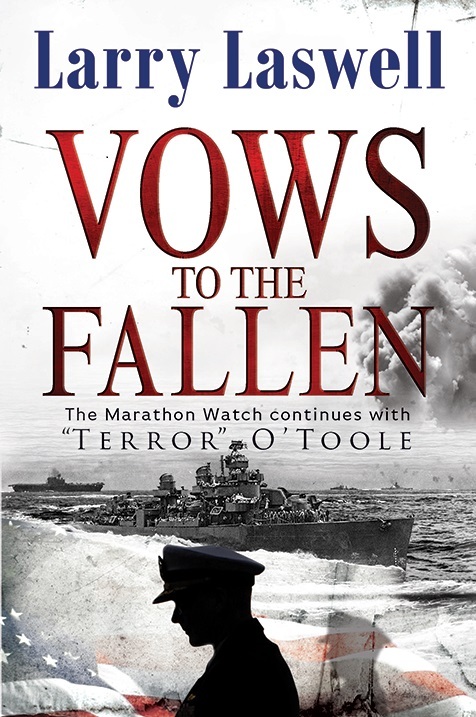 The Pacific War does not wait for O’Toole to heal. Duty calls, each new assignment brings more responsibility, and the roll call of the fallen grows. At the Battle of Mujatto Gulf, O’Toole faces a superior battle-hardened Japanese fleet and discovers the strength within him to climb from the abyss and find his true life’s mission. To the fallen, he vows never to abandon that mission no matter how high the cost. 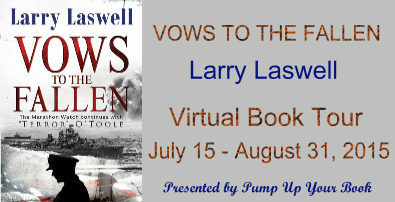 Larry served in the US Navy eight years. In navy parlance, he was a mustang, someone who rose from the enlisted ranks to receive an officer's commission. While in the navy, he served as Main Engines officer aboard the USS Intrepid CV-11, and as Submarine Warfare Officer aboard the USS William M Wood DD-715. Now retired, he fills his spare time with woodworking and furniture design. 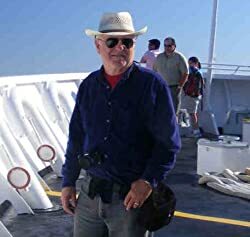 He continues to work on The Marathon Watch series, an upcoming Science Fiction series, and an anthology of over eighty humorous sea stories. This was an interesting read for many reasons. One, the historical aspects of Pearl Harbour are merged into the fictional life of Liutenant O'Toole. While O'Toole's character starts out with confidence, this confidence soon slowly disappears and we see him tumble emotionally. His thoughts of being inadequate soon cloud his everyday life. But how much time does he have to process such feelings? The author instills a sense of urgency in the reader and this was the best part of the book. Soon, O'Toole is only another element in the story as war takes over the pages and the reader grimaces at its effects. Plus points to the author for being able to hold the reader's attention right to the end. Would I recommend this read? Definitely. If you like historical military fiction, this book is right up your alley. Offensive content? : Based on language and settings, I would recommend this book for anyone aged 18 and up.